As Royal Caribbean prepare for the upcoming debut cruise of their newest ship, more and more of its exciting features are being revealed. 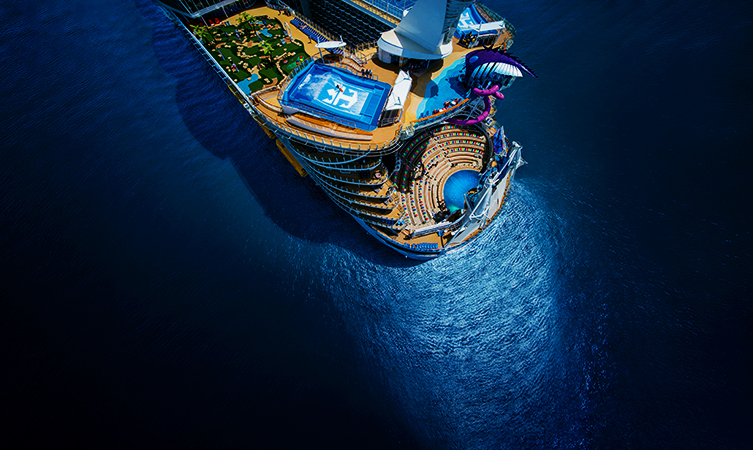 As an ‘Oasis class’ vessel, Symphony of the Seas will mirror the size and splendour of sister ships Oasis of the Seas, Allure of the Seas, and Harmony of the Seas. She will boast a huge array of impressive entertainment and recreational activities, as well as a wide range of stateroom options and dining venues. Hooked Seafood – a contemporary option serving fresh fish, both cooked and raw. El Loco Fresh – offering tasty Mexican fare. Sugar Beach – for those with a sweet tooth, serving ice creams and confectionary. Head to the Playmakers Sports Bar & Arcade to keep up to date with your favourite sports teams, or play a few rounds on the gaming machines. But the fun doesn’t stop there. Four incredible new Broadway-style shows have been created, so all guests will surely find something for them. Be whisked away in the magic of these captivating shows, and absorbed in some dazzling stories and music. In addition to these onboard, public features, Symphony of the Seas offers some brilliant accommodation options. A favourite being the new Ultimate Family Suite, which is a colourful haven with soft play and even a slide. See our Symphony of the Seas cruises, and start planning your family’s next adventure! Pre Registration for P&O Cruises and Cunard 2017 World Cruise is now open!